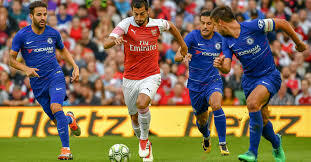 Today's game was as expected, when two strong teams like Chelsea and Arsenal meets it is always interesting and dramatic, Pedro's early goal on the 9th minutes with assist from Marcos Alonso lifted the moral and spirit of the blues as Alvaro Morata double the goal with assist from Cesar Azpilicueta in the 20th minutes. Arsenal never cease to increasing their pace to equalize as Henrikh Mkhitaryan of Arsenal scored the teams first goal from outside the box in the 37th minutes to increase the moral and hope of the team, the game became more interesting as Arsenal was trying to equalize on the 41st minutes Alex Iwobi of Arsenal scored the teams second and equalizing goal making it 2-2 in the first half so dramatic. The second half was about to end goalless before Eden Hazard on the 81st minutes gave a pass to Marcos Alonso which Alonso never hesitated to make proper use of and it's a goal making it 3-2 in favour of the blues. It was a good performance from Sarri's men as they continue to win their premier league games. Chelsea will meet Newcastle on Sunday 26th of August while Arsenal will meet West ham on Saturday 25th August for their next games.